Below you can find driving directions from Google Maps to help you get from Cooper City to your nearest Fix Apple Now store, situated in Weston. You can either copy the driving instructions below or click here for a larger map and driving directions. Talk to Fix Apple Now today if you require a repair for your iPhone 4, 5 or 6, iPad, iPad Mini, Apple Mac>/a>, MacBook Air, Apple Mac, MacBook Pro or iPod in Cooper City. At Fix Apple Now, we've been providing high-quality Apple repair services for many years and can be counted on to deliver the excellence you're looking for. Whether you've got a bent iPhone 6 Plus, your camera or Bluetooth won't work, you can't hear during calls, your screen is cracked or frozen, you can hear crackling through your headphones, can see enlarged icons or dye is filling your plastic strips, we can assist you. Our engineers are experts in their field and can mend, fix, replace, repair and restore your Apple device. We always work hard to beat our customers' expectations and can be relied upon to deliver the outstanding service you've been looking for. 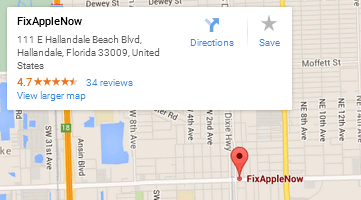 Why wait any longer to get in touch if you need to fix your Apple in Cooper City?